Do you have a comfort dish that takes you bake to your childhood? For me, a creamy potato soup reminds me of my mom. She would always make it for me when I was sick. And I was sick often with asthma, well, the medications tended to almost make me more sick than the actual asthma. Mom's was very thick, almost like extra creamy, super thin mashed potatoes. I remember pretending that it was Malt O-Meal. I was a little obsessed with the commercials, but we never had Malt O-Meal. It was often one of the very few things I could keep on my stomach. The asthma medication always made me very nauseated. So for me, it was a true comfort dish. Jason has memories of a potato soup that his mother made for him as well. For ages he's been wanting to make potato soup. I just haven't been able to hop on board a bowl of potatoes though. But I finally gave up the fight and let him make his soup. This is a vegan version using tempeh bacon. To get another level of smoky flavor, he used liquid smoke. And instead of a heavy cream, he used unsweetened almond milk, which has a thick consistency. 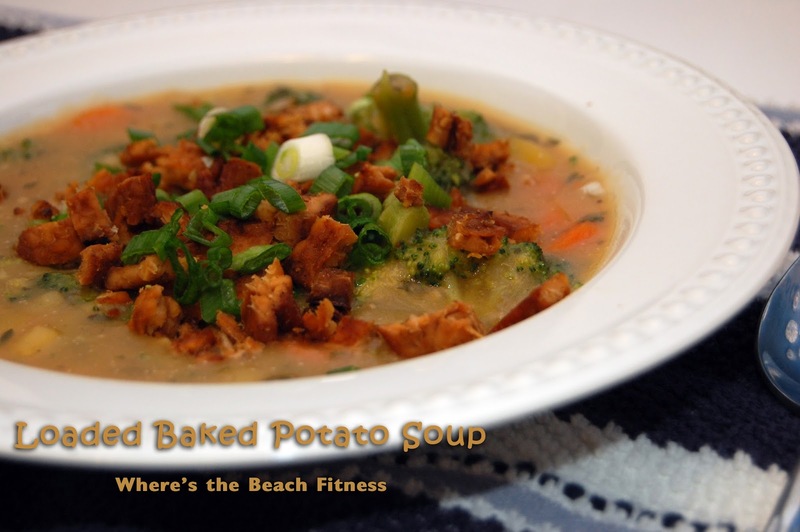 Because of the toppings, we decided this was more like a loaded baked potato, hence the name Loaded Baked Potato Soup. In a large soup pot, saute potatoes, onion, garlic, and carrots with the spices until onions became translucent and potatoes begin to brown. Next add in the water, Better than Bouillon Base, liquid smoke and re-season if needed and allow simmer for approximately 10 minutes. Mix almond milk with xantham gum and add to the soup. Allow to simmer and thicken for approximately 15 minutes, re-season if needed. Add in the broccoli and allow to continue to cook until all the vegetables are cooked through. In a non-stick skillet, crisp up the tempeh bacon then crumble and set aside. 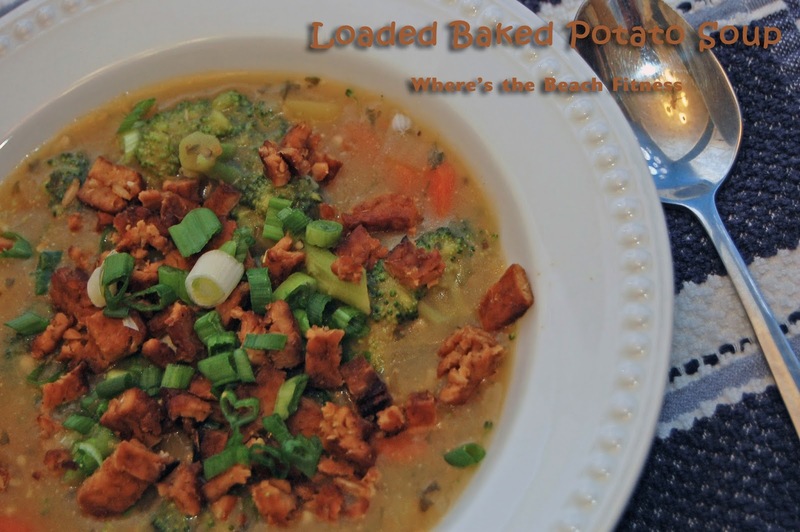 Top the soup with the tempeh bacon and chives. For a true super loaded baked potato experience, top with sour cream and cheese. This was nothing at all like the potato soup of my childhood, but that's definitely not to say it wasn't good. It was very rich in flavor, creamy but also full of texture as well.